Stylish, and affordable, the Chelsee attracts smart spa shoppers. Four corner seats (everyone loves comfy corner seats), each delivers a distinct type of therapeutic massage. The Vortex™ Jet gives a unique rifling action for a high and low impact therapeutic massage. 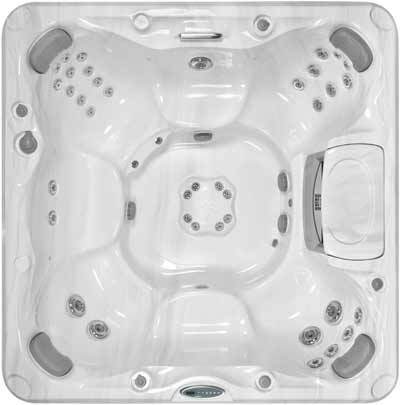 The unique Reflexology Foot Dome with eight powerful jets is another feature you seldom find in luxury hot tubs or discount hot tubs. In fact, the Soothing Muscle Therapy, or SMT™ jets and highly effective Accu-Pressure™ jets in the Chelsee give you a choice of specialized jet-massage therapies. Dimensions - 7'5" x 7'5" x 36"